Fighting Fatigue: Why Am I So Tired...?? Runners commonly complain about fatigue and feeling too tired, too often. Granted, many of them wake up at early o-thirty to run, and some do killer workouts that would leave anyone feeling exhausted. Many routinely get too little sleep. And the question remains: How can I have more energy? Vitamin pills will not boost your energy. Vitamins help convert food into energy, but they are not a source of energy. Save your money. Adequate sleep, however, will indeed boost your energy. Sleep is essential to recharge your body with the rest needed to feel fully functional and perform well. Eating the right foods at the right times is also energizing and fights fatigue. 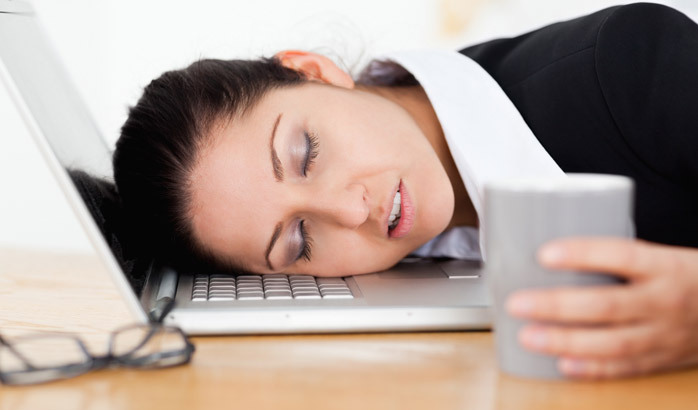 The combination of adequate food plus adequate sleep not only sharply reduces fatigue—but also the need for caffeine. In particular, the late-afternoon cup of Joe that contributes to the bad cycle of sleeping poorly at night, having “no time” for breakfast, under-fueling during the day, and fighting chronic fatigue all afternoon. Sound familiar? No wonder, when Tom got home from work, he felt starved. He had consumed less than half the calories he deserved to have eaten for the entire day. #1 Eat a substantial breakfast and lunch—plus a second lunch. A second lunch at 3:00 or 4:00 boosts afternoon energy. It does not add extra calories; it’s just trading evening snacks for a healthy afternoon meal. You are better off eating those calories at the proper time of day, when you need the energy, and not before bed. #2 Limit caffeinated beverages. Little is wrong with enjoying a morning cup of coffee, but a lot is wrong with abusing coffee to keep you alert in the afternoon. Eat food for true energy, not caffeine, for a stimulant. #3 Make sleep a priority. You might not be able to go to bed earlier every night, but maybe every other night? Most runners have no idea how much food is appropriate to eat at Breakfast, Lunch #1 and Lunch #2. No wonder they are tired all the time! Many think a yogurt for breakfast, salad for lunch, and an apple for a snack is appropriate. That’s only 700 to 800 calories — way too little! Resting Metabolic Rate (RMR) Weight x 10 calories/lb. Dinner: smaller meal that contributed to better sleep. Food is indeed a powerful energizer. Give it a try. Sports nutritionist Nancy Clark MS RD CSSD has a private practice in the Boston-area (Newton; 617-795-1875), where she helps both fitness exercisers and competitive athletes create winning food plans. Her best-selling Sports Nutrition Guidebook, and food guides for marathoners and new runners, as well as teaching materials, are available at www.nancyclarkrd.com. For online and live workshops, visit www.NutritionSportsExerciseCEUs.com.